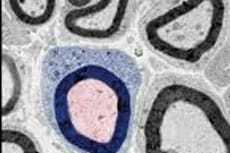 Multiple sclerosis, an autoimmune disease in which immune cells attack the fatty protective layer of myelin cells, may have a potential treatment. Through stem cell techniques, a team led by Steven Goldman report in Cell Stem Cell the generation of myelin cells from human skin cells. The researchers implanted these new myelin cells in the brains of young, myelin-deficient mice, which greatly increased mouse survival. However, the successful hypothetical transplantation of these cells in human multiple sclerosis patients does not eliminate the immune system’s siege on this cell type. An application of this therapy would likely have to complement other treatments or performed repeatedly.